CNOOC: China National Offshore Oil Corp.
CNPC: China National Petroleum Corporation, where Zhou Yongkang was a senior official from 1988 to 1998; CNPC is also the controlling shareholder of PetroChina Co., Ltd. The greatest unsolved mystery in China right now is not the disappearance of Malaysian airliner MH370 but the fate of Zhou Yongkang, the feared former head of China’s security apparatus. From 2007 to 2012 a member of China’s top political body, the Politburo Standing Committee, Zhou is now reportedly under investigation for corruption, casting suspicion on hundreds, if not thousands, of his of his allies, subordinates, and relatives. If the reports prove true, Zhou is the most important Chinese official to be targeted for corruption since the Chinese Communist Party came to power in 1949. 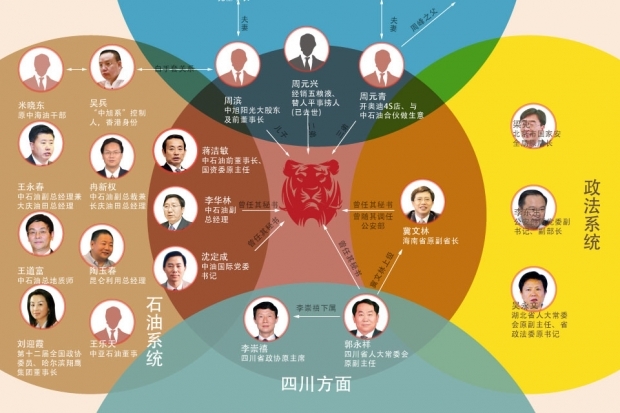 Chinese media has responded to this unprecedented opportunity with gumption: Over the last few weeks, both state-run and more independent Chinese media outlets have begun tracing connections Zhou made as a top official at the state-run oil behemoth China National Petroleum Corporation (CNPC), as Party boss of the important province of Sichuan, and as Minister of State Security, before he ascended to the pinnacle of Chinese power. Some have published graphic representations of the web that Zhou allegedly wove. The chart below was first published in China by the popular Chinese web portal Netease on March 5, and has been adapted and translated by ChinaFile and Foreign Policy. The investigation into Zhou is both extremely important and maddeningly opaque. 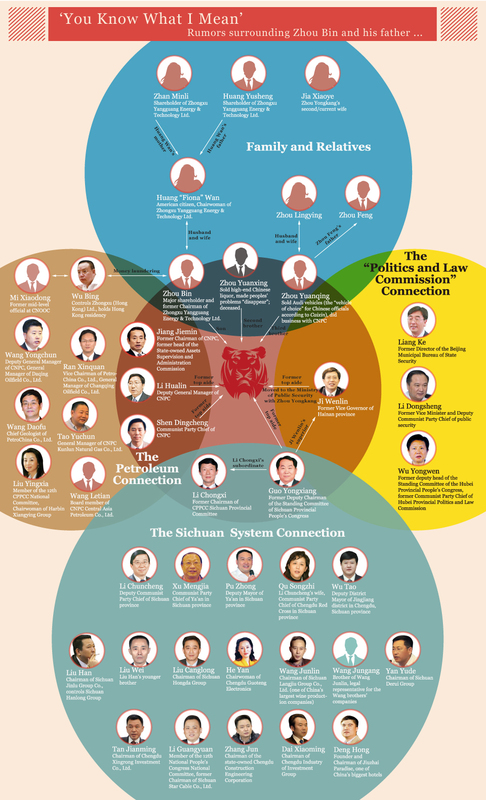 We are unable to confirm the veracity of the allegations the chart makes—that all of the people in it are connected to Zhou and that they played a role in his alleged misdeeds. Some of them, like his son Zhou Bin and tycoon Liu Han, are widely believed to be part of the case against Zhou—but much remains unknown. Thus far, Beijing has kept silent; Chinese officials do not publically utter Zhou’s name. Perhaps the most concrete mention came in early March, in the run-up to China’s annual congress, when a party spokesperson obliquely referred to Zhou’s situation as “you know what I mean.” Following that lead, Chinese media began to call Zhou either “you know what I mean”—a phrase usually reserved for superstitiously cautious invocations of gods or demons—or to refer to him by his birth name, Zhou Yuangen. If Zhou’s enemies do take him down, here are some others who may well fall with him. This graphic was translated by Yiqin Fu and Yun Yu, and adapted by David M. Barreda.